Are you looking to make up for all the golf you've missed out on this winter? 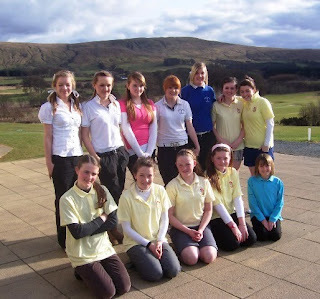 Then why not come and play in the 2010 Scottish Ladies’ Amateur Championship at Craigielaw Golf Club from 18 – 22 May. - Prizes for County teams of three players. The format of the Championship is two rounds stroke play qualifying over 18 and 19 May with the lowest 32 aggregate scratch scores qualifying for the main match play Championship and the next 16 qualifying for the 2nd flight, the Clark Rosebowl. In addition to the golf, the ‘Scottish’ is also renowned for being a great social week of golf and is always a chance to meet up with friends old and new. If you’re not lucky enough to make it to the latter stages it’s a great opportunity to watch the top Scottish Amateurs compete for the title and for those that don’t make it to the final of the main Championship, there is always the legendary Friday night party to look forward to. 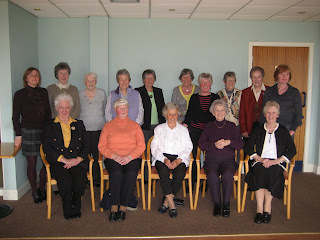 The venue for the 2010 Championship is Craigielaw Golf Course in East Lothian. This is a Championship links course which also boasts outstanding practice and clubhouse facilities. The entry fee of £35 will guarantee you three rounds of golf (including one practice round). Entry Forms from the SLGA web site. 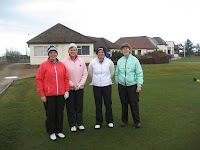 The final was played on Monday 22 March at Barassie Golf Club. Early in the morning the weather was not looking good for the final with strong winds and rain. At 11.00 the winds reduced and the rain stayed off for most of the round. Irene and Sara Ann were giving 7 shots to Janice an Allison. 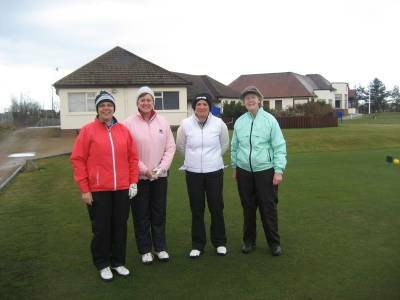 The final was keenly contested with Janice and Alison eventually winning on the 17th hole, 2and 1. Congratulations to the winners Jancice and Alison and also to Irene and Sara Ann for reaching the finals. 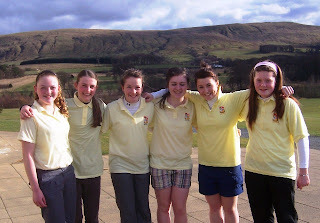 Ayrshire Girls posted a win in their first friendly match of the season against South of Scotland Girls on Sunday, 21st March. This was played on a fine dry day over Brunston Castle Golf Course. Results are as follows:- Ayrshire names first. Handicap allowances are given.